« Picture of the Week – Got Trees? 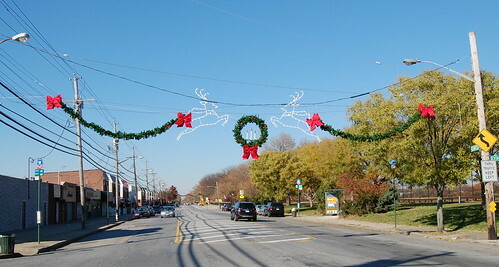 For residents, We know you have seen the great decorations on Gerritsen Avenue. Many have wanted to know who was responsible. GB Cares along with volunteers installed the lights this year and every previous year. We hope that this letter finds you in good health and great spirits during if this holiday season. The holiday decorations along Gerritsen Avenue mean something different to each resident. For some. they are a great reminder that YOU are finally home at the end of a hard days work. To others. they are a reminder of the short days and long nights during this time of year and make us wish for summer. In any case. we hope that they put a smile on your face by giving you a bit of holiday cheer. Thanks to donations from residents. local businesses. organizations and elected officials. we have decorations to install each Year. We want to give a,special thanks to everyone that helped fix and install the decorations on Gerritsen Avenue. If not for these volunteers the cost for decorating, Gerritsen Avenue would be about $10,000 a year. 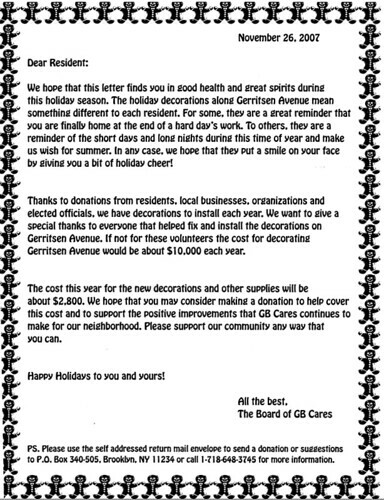 On Saturday 11/24/07 starting at 8:30 a.m. GBC started the installation of the Holiday Lights on Gerritsen Avenue. We had a larger crew to help this year and it made a big difference finishing at about 5:30 p.m. to watch as the lights went on for the first time this year. It is with great pleasure that we would like to thank the many volunteers who assisted making Gerritsen Avenue festive for the Holiday’s to list a few but not limited to: Buddy DeWitt, Joe DeSimone, Dan Smith, Bob O’Reilly, Mike Stapleton, Chris Nefleberg, Mike Bianco and his Engine 5, Bob Banham Sr., Bob Banham Jr., Dan Durocher, Janet Behrens, Richie DeWitt, Mike Kowalski, Anthony Baisden, and Michael Taylor. also, The Dragonetti Brothers Landscaping donated the use of their bucket truck to install the decorations across the Avenue. Thanks to this group effort we can enjoy a very festive Gerritsen Avenue. We wish all a Merry Christmas, Happy New Year and Happy Holidays to all. Great job – thank you for taking the time to create such a nice Christmas scene. It is so nice to see the community working together to create something for all of us. Hopefully this will stimulate more people to get involved. Thank you.